Impeachment is a provision within the Constitution the drafters, and those who ratified the Constitution, gave us as means to not only dismiss those from office who have violated their solemn trust, but to also ensure those impeached could never hold office again and therefore hold the opportunity to violate that trust again. Impeachment is found in several sections of the Constitution; Article 1, Section 2, Clause 5; Article 1, Section 3, Clauses 6 and 7; Article 2, Section 4; Article 3, Section 1- each section adding to the other the proper meaning, purpose and application of the power of impeachment. Article 1, section 2, clause 5 makes it clear that impeachment rests in the House of Representatives. It is a clear obligation placed upon the house to maintain not only the integrity of the government, the separation of powers, but also the confidence of the people in their government. Congressional responsibility to the people of this country is great. Article 2, section 4 of the Constitution leaves no choice for the House in this matter once Congress makes a finding of guilt. ALL CIVIL OFFICERS is a catch all that included everyone who currently works for the federal government as an elected or appointed officer or has worked for the federal government in that past. Some may argue that once a person leaves federal employment, the option for impeachment is no longer viable. However, the precedent of impeachment tells us otherwise and a view of history can help us understand why. William Belknap served as Secretary of War under Ulysses S Grant from October 25, 1869 – March 2, 1876. While Secretary of War, Belknap’s extravagant life style came into question. You see, Belknap only made $8k a year but was known for his extravagant lifestyle and expensive parties. Congress launched an investigation into his finances and found corruption that extended back to 1870. Some of the accusations against Belknap included, indirectly selling weapons to France and for accepting illicit kickbacks in exchange for making political appointments. Gun running, kickbacks, political deals for financial gain…isn’t that exactly what evidence strongly suggests Hillary Clinton is or was involved in? The character of Belknap can be seen in numerous modern politicians. Yet what does Congress do today? NOTHING, but excuses. I missed the Constitutional Amendment that changed the Congressional power exercised in 1876 into the powerless and excuse ridden Congress of today. 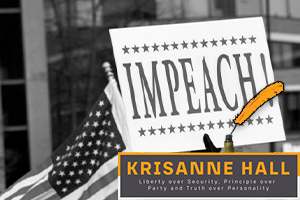 The power of impeachment is not simply a responsibility of Congress. James Madison, Father of the Constitution and 4th President, explains that although it is Congress who impeaches, if that civil officer first falls under the authority of the President, the president has a responsibility to first remove that person from their position or else suffer, himself, the consequences of impeachment for failure to check his employees! Congressional hearings USED to actually have consequences. Congress USED to exercise real power. Congressmen USED to know their duty to the Constitution, their obligation to preserve Liberty, and their obligation to control the executive branch. Nothing about the Constitution or the power of Congress has changed since 1876, so what has changed? What has changed is the knowledge and courage of Congressmen! Since it is clear, by those who ratified the Constitution, that the President of the United States has direct power over his agents, is directly accountable for their actions, and can be impeached, himself, for failing to govern proper Constitutional control over his agents, shouldn’t Congress also be held accountable for their failure to govern proper Constitutional control over the executive branch? Isn’t it time We The People start requiring real Constitutional proficiency, instead of simply accepting the flowery speeches and rhetoric as chief political qualification? With this knowledge in hand, while civil officers in Congress are throwing around the threat of impeachments, there is no excuse as to why James Comey, Eric Holder, Lois Learner, Hillary Clinton, Barack Obama, and yes several Supreme Court justices ought not be impeached even today. We do not need a new Constitution, a new amendment, or a new interpretation of the existing Constitution. We need an American people who possess a working knowledge of the Constitution and a active integrity fueled by a moral courage to require those elected, who took an oath to “protect and defend” the Construction, and are entrusted with that solemn responsibility to simply do their jobs. However, until the people expect and demand adherence to the Constitutional standard, the spoiled adolescents we call representatives will continue to do their own will, to their own benefit, to our own destruction. If this statement leaves you befuddled or frustrated, it is only because you have been denied the truth available through proper education on how to control your federal government. The truth is out there, but its not in the hands or the heads of those we need to control. There is a highly effective and may I explain, peaceful way, to control your governments. If you are interested may I humbly suggest a book titled, Sovereign Duty… available in many online bookstores. The final outcome is truly up to us.